As any blogger will tell the uninitiated, there’s much more to blogging than writing. It can be easy to forget everything you need to do – from adding in links to tagging your posts. So I gave up trying to remember. Instead, I did what I do with all aspects of life that get too complicated … I created a to-do list. I admit, I may have an obsession with checklists. I use Trello.com to keep them all organized and when I show the lists to people, their eyes usually bug out. However, they work for me, and I’m not the only one. In The Checklist Manifesto, Harvard Medical School professor Atul Gawande demonstrated how checklists for mundane tasks like hand-washing significantly reduced hospital-caused infections. Although a blog post checklist may not save lives, it will save you time and possibly your blog by ensuring you do everything necessary for success, the first time around. 1. Research your topic and find your perspective. You have an idea for your blog post, now it’s time to dig deep. Pitches, prompts, and press releases are incredibly helpful for coming up with an idea. But you need to put them into context and put your own perspective into the post. 4. Write a headline. You may think I’ve completely lost it. However, writing a headline after you’ve outlined and before you start writing the post can give you a jumping off point for the rest. Once you’ve written your post, go back to the headline’s rough draft and make changes as needed. 5. Brainstorm visuals. You don’t have to have your image ready at this point, but you should start thinking about the visuals you want. Would a graphic, photo, or video work best? And how many do you think you’ll need? Once you have a general idea of what you’ll want, you can set aside enough time to create or find the visuals you need. 6. Lede. After your headline, the lede or introduction is what will keep your readers around. Use your nut graf as your basis, but make it attractive. An entire blog post could be dedicated to writing an introduction, but a few ideas include personal anecdotes, questions, or finding common ground with readers. 7. Scannable content. Don’t let your readers’ focus wander because of large blocks of text. Section headings, short paragraphs, bulleted or numbered lists, images, bolding and other formatting cues will help, especially on long posts. 8. Call to action. What action do you want your audience to take while reading your blog post? Let them know! Calls to action include having them answer a question, enter a sweepstakes, and share or subscribe to your blog. 9. Meta-description. Your meta-description is what will show up in search engine results and social media previews. If you have the ability to customize your meta-description, check out this HubSpot post for writing tips. 10. Photo. Now that you have your blog post written, you can go back to the image ideas you brainstormed earlier and find or create one that complements your text. You want images that are relevant and unique — avoid stock photos. If you need help, check out Buffer’s lists of 53+ free image sources and 23 tools to create images. TIP: Bloggers have access to thousands of free images on PR Newswire for Journalists. 11. Alt text. In addition to making your site more accessible for visitors with visual impairments, an image’s alternative text or “alt text” is also used by search engines to define how your image relates to the rest of your content. So use this field wisely when uploading a new image. Need help deciphering the different uses for alt text, captions, photo titles, and descriptions? Morten Rand-Hendriksen’s post on image metadata offers some great advice. 12. Attribution. Whether you’ve referenced someone else’s ideas and statements or are using an image that is not yours, remember to give credit and link back to the source material. If it’s someone else’s image you’re using, you also have to make sure you have permission to use it. My rule of thumb? If I can’t verify an image’s copyright status and I don’t have an opportunity to ask its creator, I find another visual. 13. Categories and tags. Using blog post categories and tags can help visitors navigate your site’s different posts. On Beyond Bylines, we use categories to organize posts into broad subject matter or audience groupings. Our tags, on the other hand, are more specific. Avoid overloading your post with too many tags or categories, as search engines could penalize you if they think you’re gaming the system. 14. Your final headline. Remember that headline you wrote in step four? Go back to it and see if it’s still relevant. If not, make edits or write a new one. Our post on 9 headline writing don’ts can help. Once you finish writing and formatting your post, you’ll need to edit it. Take a break and come back to it with fresh eyes. It also helps if you can have someone else read it. When you read through your draft, here are five questions you should answer. 15. 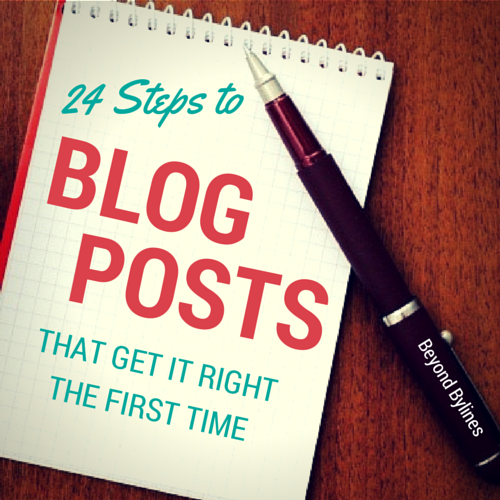 Does your post fit the tone and topic of the rest of your blog? 16. Did you give your readers a reason to care about the blog post? 17. Is your storytelling interesting and colorful? 18. Did you deliver on your headline’s promise? 19. Have you checked it for grammar and spelling? Now you’ve written an awesome blog post. But there’s still work to be done. Once your blog post is published, do these five things to ensure success. 20. Promote. Share your blog post with your social media networks, and then share it again. Identify forums and online communities that would find the post relevant. And if you have an email list, be sure to send them your content. If you don’t have an email list, start building one. 21. Engage. It’s important to cultivate a relationship with your readers and other bloggers. It helps build your influence, encourage return visits, and attract new readers. Ask questions in your posts, encourage comments on your blog and social media, and remember to respond! 22. Track. How did your blog post do? Was it shared, read, commented on? Numbers shouldn’t rule what you do, but they can be helpful when understanding how to grow your blog. Tracking doesn’t end in the days following your post’s publication. If an older post has gotten a recent surge of views, take note of why. 23. Evaluate. Look at your blog post in the larger scope of your site. How does it compare with other posts you’ve done? What sites and social media networks drove traffic to it? If it was successful, what parts of the post did readers respond to? Taking time to evaluate your most and least successful posts will give you insight about your audience that you can replicate or avoid in the future. 24. What’s next? Now that your blog post is written, published, and promoted, it’s time to look ahead to your next blog post. What will you write about? Is there anything in your previous post you can expand on in the future? While there are a lot of to-do items on this list that will apply to most bloggers, my biggest recommendation is to sit down and write your own. Go through the items in my list, read other people’s blog post checklists, and choose the ones relevant to you. Then test your list out. You — and only you — will know what process is the most effective. For more best practices and resources that will help you find blogging success, join me April 2 for the PR Newswire webinar Going the Distance: Tips for Finding Your Blog’s Focus & Defeating Blogger Burn Out. Register at http://bit.ly/1Mug8PL, then tune in April 2 from 1-2pm ET and live tweet with us using #blogtips. Amanda Hicken is a media relations manager with PR Newswire for Journalists. Follow her at @ADHicken for tweets about the media, comic books, and her love of Cleveland. Reblogged this on Telecomcircle . thank you for this article. Pretty usefull for newbies like me!! Thanks for the kind words! I hope you can join us for our blogging webinar on April 2nd or tune into the replay.